Productivity, efficiency, and cost effectiveness are key factors for vegetable harvesters, and fennel harvesters in particular. Agricultural machines are developed specifically with farmers and machine operators in mind. Such is the case with the fennel harvester and fennel growers. The Fennel Harvester is a fine specimen of tradition and innovation coming together in modern technology to produce a mechanism that satisfies the needs of farm operators. The machine was developed taking on board observations made through the diligent observation of farm operators and their feedback. 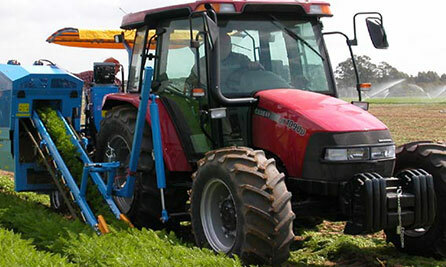 The Fennel Harvester is designed with two rotating steel blades that are mounted on a height adjustable support wheel. These blades cut the fennel by the roots for effective harvesting. The harvester is also equipped with a hinged elevator that allow the fennel to easily slide into the container without wastage. Performance, reliability, and minimal operating costs are top features that fennel growers desire in their harvesters. Thanks to the continuous push to improve on harvesting technology, the fennel harvester is updated to include high performance technology such as hydraulic systems that are of the highest quality. The machine’s superb design flexibility allows for cost effective upgrading when needed, therefore making it the ideal harvester for all category of users.